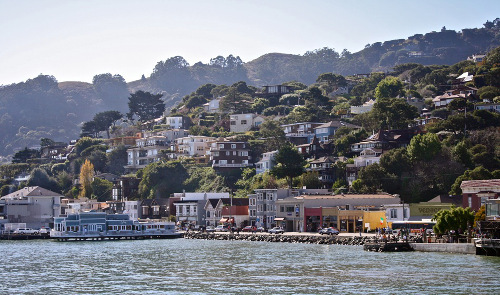 Sausalito is about 6 mile north of San Francisco. The community is situated just past the north end of the golden gate bridge and prior to the building of that bridge served as a terminus for rail, car, and ferry traffic. Developed rapidly as a shipbuilding center in World War II, the city’s industrial character gave way in postwar years to a reputation as a wealthy and artistic enclave, a picturesque residential community (incorporating large numbers of houseboats), and a tourist destination. It is adjacent to, and largely bounded by, the protected spaces of the Golden Gate National Recreation Area; an absolutely stunning place to live!